It was a lovely party had by all for my sweet seven year old son. It was supposed to be an outdoor BBQ, but the dreary overcast weather brought us all inside for an evening of good food consisting of steak, chicken, pasta salad, couscous, more salad, shrimp, raw veggies, fresh fruit and delightful cakes. I really should have taken a picture, but I was getting over a whomping migraine headache so let's just say not all my faculties were in order. I did manage to grab a photo of the Birthday Boy, he was so happy and excited to be celebrating "himself"
My son B finds enjoyment in the simplest of treasures. 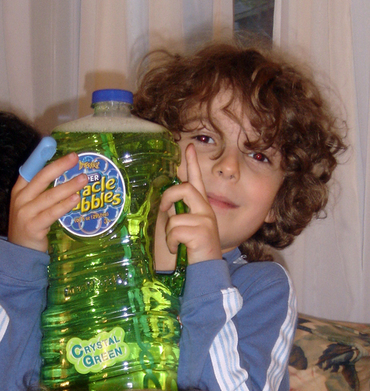 When one of my sister's phoned me to find out if there was anything special he wanted for his birthday, the only thing that came to his mind was a big bottle of bubbles. He is just too easy to please. 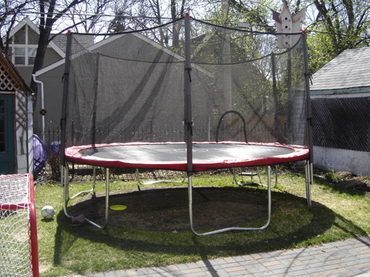 To top off his pleasure, we purchased a 14' trampoline which delighted B beyond imagination. Many of our party goers also contributed funds to the trampoline making it one of the most popular group gifts by far. My dh put it together and it is huge! It takes up a good section of our yard on the west side, but so far has provided hours of jumping delight for all my kidlets. I really do need a picture of my kids in full jump mode, they are all having a blast.